Further data and analysis on the progress toward ending rural hunger is available at endingruralhunger.org. The world is off track to meet its own deadline for ending hunger. For the first time in many years, the estimated number of undernourished people has actually gone up rather than down. It now stands at slightly more than 800 million undernourished people worldwide, according to the Food and Agriculture Organization. One of the internationally agreed upon Sustainable Development Goals is to get hunger to zero by 2030, so there is a long way to go. Other indicators like stunting in children under five years of age do show modest decline, but on the current course it would still take 42 years to achieve zero stunting. Clearly, something needs to be done to accelerate the rate of change. Hunger remains a universal problem. 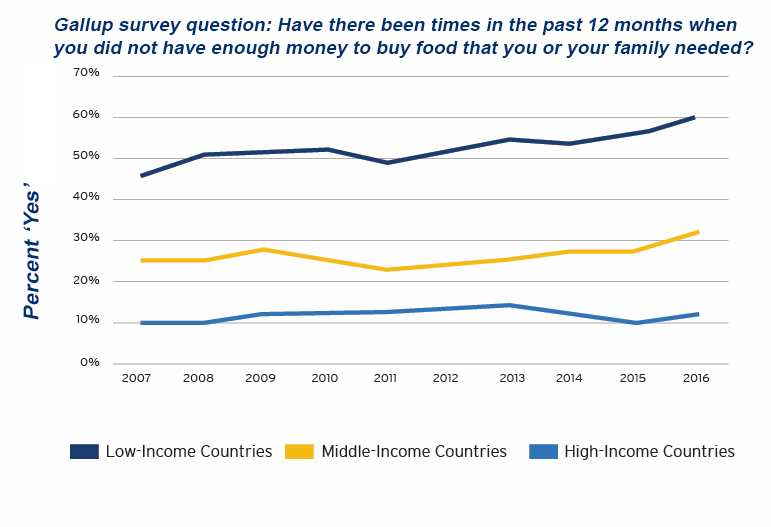 Figure 1 shows results from a Gallup poll taken over the past decade, asking respondents whether there have been times in the past 12 months when they didn’t have enough money to buy food. In low-income countries, the share has gradually increased to around 60 percent. In middle-income countries, it’s stuck around 30 percent. Even in advanced economies, it’s quite high, somewhere near 10 percent. There are about a billion people living in advanced economies, so 10 percent means 100 million people still grapple with food insecurity in high-income countries. Even more striking, there is no evidence of any improvement over the past decade. While the world has become considerably richer, the issue of hunger has not become appreciably smaller. If we focus on the problems in the poorest countries, the issues start with low levels of productivity in rural areas. Sixty-five countries in the world are eking by with average cereal production at less than two tons per hectare, with little recent improvement. Yields are likely much lower for smallholder farmers among whom hunger is concentrated. In the realm of agricultural policy, unfortunately the FAO agriculture orientation index indicates that things are moving in the wrong direction. There were more non-tariff barriers imposed on agricultural trade last year than the year before. And global agricultural subsidies are still averaging upward of $500 billion a year, which shows that money is being spent on related issues, but not in an efficient or targeted way. One bright spot is a commitment made in Nairobi at the World Trade Organization Ministerial for all advanced countries to eliminate their export subsidies on agricultural goods. In May, Australia became the first country to live up to that commitment. The OECD countries, long infamous for their large agricultural subsidies, are actually bringing these down. 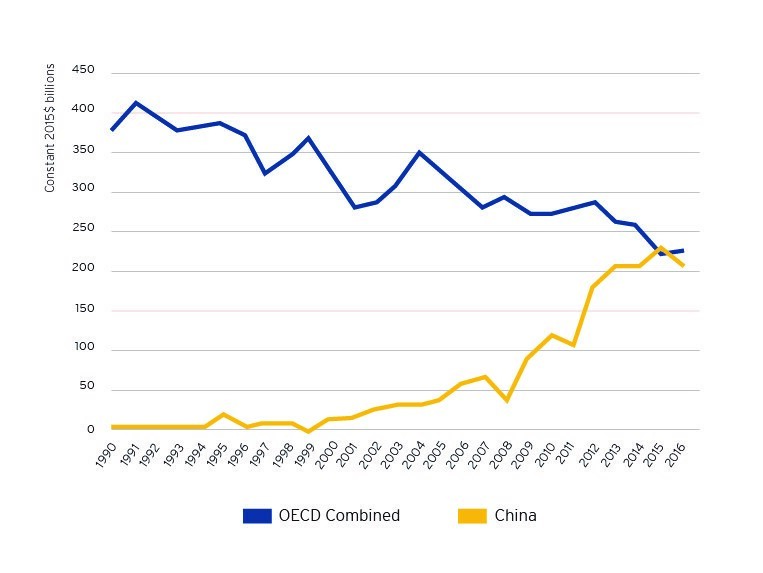 But China, which is emerging as a major player in world food markets, has ramped up its level of subsidies (see Figure 2), leaving total subsidies still hovering at nearly half a trillion dollars per year. Looking at resources for agriculture, private credit tends to be most crucial. But in looking at data for 70 plus developing countries, overall agricultural credit showed essentially no growth, and there is some evidence that the lack of access to private credit is a worse problem in countries where smallholders are a larger share of the agricultural sector. Similarly, in countries where data are available for government spending, the trends are downward rather than upward. There are some slight increases in commitments and disbursements of overseas development assistance, but these are modest changes. Figure 3 show the needs (circles) alongside the amounts (bars) that are actually being spent on food and nutrition security per person living in rural areas. In a wide range of countries, total spending on food and nutrition security is less than $10 per person per year. At that level, reductions in hunger are unlikely. But a number of countries are making progress and spending around $300 per person per year. The contrasting dollar numbers give a sense of the scale of resources needed to change trajectories. 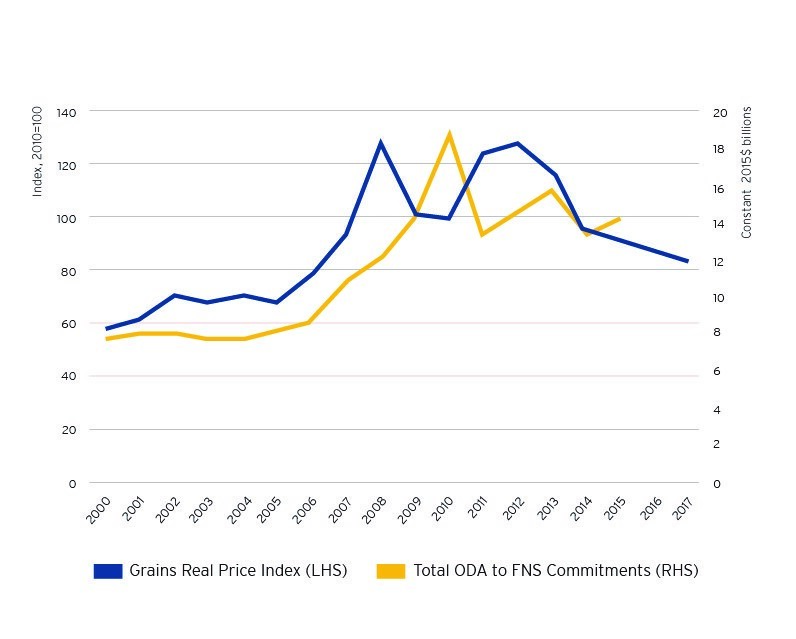 Internationally, food prices have started to come down from their peak, which seems to lead to declining donor commitments to food and nutrition security (see Figure 4). 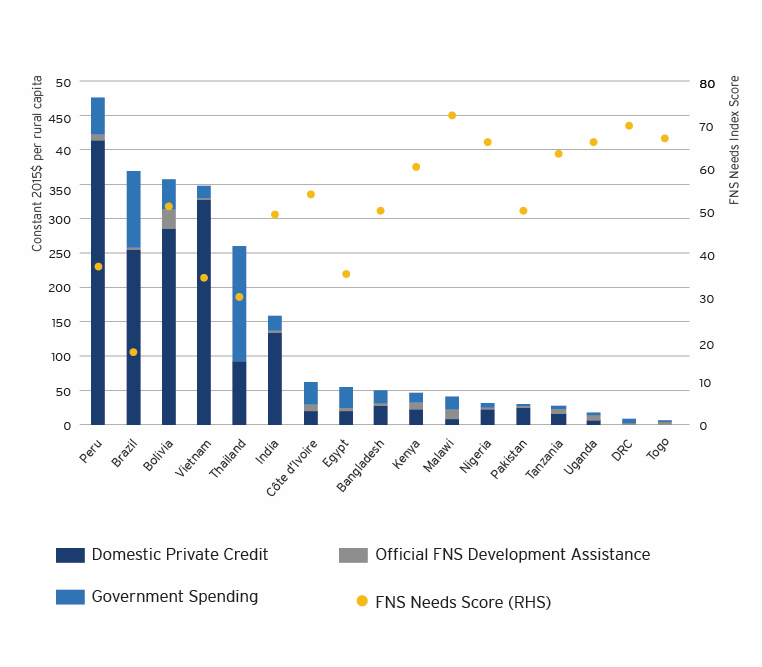 When it comes to official development assistance, the last major commitments were made at the 2009 G-8 summit in L’Aquila, Italy, which mostly expired in 2012. No subsequent commitments mean no subsequent accountability. In sum, we’ve got a massive global problem, and it’s getting worse. Policies aren’t changing much, and resources are flat. So what can be done? Better progress requires better accountability. To start, this hinges on better data. Today, the relevant data sets are neither timely nor of high quality. They are regularly being revised and often several years out of date. International organizations can do better in this regard. It is encouraging that a number of them collaborated to produce a State of Food and Nutrition Insecurity this year (incorporating nutrition for the first time), but the report still does not present confidence intervals for data trend estimates, nor systematically review whether policies and resources are adequate for ending hunger. Nor does it identify where the greatest problem areas can learn from other success stories. Simply writing new food and nutrition security strategies will not solve the problem. Some developing countries already have several strategies. Too often, the problem is that these strategies are not integrated or implemented in any systematic way. This, again, points to the need for time-bound, adequately ambitious, and practical strategies to meet zero hunger targets, including a transparent indication of budget gaps where needed. Are we closer to ending rural hunger? Donor countries can also do much more. In 2015, the G-7 countries made a commitment to lift 500 million people out of hunger by 2030. This needs an action plan for implementation, or else the promise becomes hollow. Companies, research bodies, major philanthropies, and civil society actors can also contribute know-how, catalytic resources, and practical experiences with implementation. The upshot is that if the world is to fulfill its own pledge of ending hunger by 2030, then dramatic improvements in data, policies, resources, and institutional performance are all required. The crucial question then becomes: With only 13 years to go, who will hold themselves and their institutions accountable for the major global deadline at hand?